With a deep breath and a passion for musical expression, the Nebraska Choral Arts Society (NCAS) was created. What started as an idea, a hope came to fruition in 1978. Former Dundee Presbyterian Church Music Director, Dr. Thomas A. Brantigan, founded NCAS. The music began with 85 adult singers, known as the Nebraska Choral Arts Society; a non-profit organization dedicated to the performance of great choral and choral-orchestral music. In 1984, Dr. Brantigan founded the Nebraska Children's Chorus (NCC). It was an idea conceived through Dr. Brantigan's exposure to children's choruses on the coasts and brought home to pursue. He nurtured the choirs for several years and then handed the baton to Dr. Z. Randall Stroope in 1987. 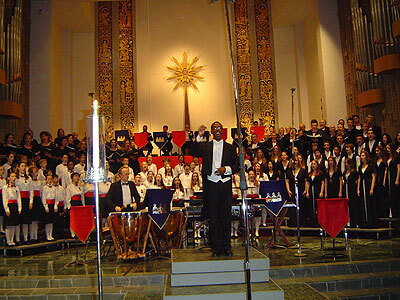 Under the direction of Dr. Stroope, NCAS Artistic Director, the organization has grown from two to nine choirs. Few organizations are fortunate enough to have two visionaries in the span of 25 years. If you've heard this choir before, you know what to expect here: lustrous ensemble sound, crisp, clear, clean articulation, irresistible rhythmic energy, keen intonation, and impressive command of some very challenging music. 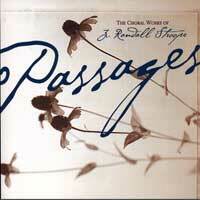 In this two-disc program (35 works) we're treated to five Magnificats, all different in style--from chant and early-20th-century settings to more "modern" versions by Herbert Sumsion, Swedish composer Agneta Sköld, and conductor Z. Randall Stroope--as well as a widely varied array of original and arranged works for treble voices. One of the more delightful aspects of listening to children's choir performances is discovering endlessly fascinating new repertoire--and we are not disappointed here. From Kis Svit--two folk-based pieces by Balazs Szunyugh--to Alice Tegnér's Ave Maria, Herbert Brewer's Magnificat in G, and Brent Michael Davids' Zuni Sunrise Song (with its very sincere attempt at authentic Native American music sounds), we are treated to a consummately entertaining program and a fascinating musical tour of music from many countries--including Finland, Hungary, Italy, and French Canada. One of my favorite selections was O Pastorelle, Addio, from Giordano's Andrea Chenier--but I also loved the high-B-flat ending of Donato's Chi la Gagliarda, the unusual Amazing Grace tune (with bagpipe intro), conductor Stroope's arrangement of Holst's Homeland, and the concluding French Canadian Reel a'Bouche, arranged by Dalglish. 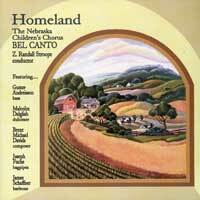 This compact disc was released by Bel Canto in 2001, and features colorful classical and folk songs from across the globe. All treble music. This CD showcases the many talents of this group. Selections range from classical to folk songs to 20th century avant-garde works. 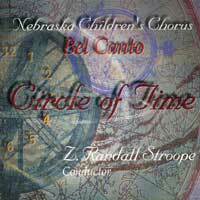 Conducted by Z. Randall Stroope. Featuring the University of Nebraska Omaha Concert Choir, Bel Canto, Canticum Novum, Nebraska Choral Arts Society & Northwest Girl Choir.